Just as Mankind emerged from the sea in evolutionary history, Aboriginal life in Arhemland advanced mythologically out of the Gulf of Carpentaria at Yalangabara to become the many clans of the Dhuwa moiety. But, while the rest of us took an eternity to develop human form and any form of society, the Djang'kawu Sisters (and their much less important brother) arrived fully formed, loaded with unborn progeny, sea-going skills and a religion with all its songs, dances and ceremonial paraphernalia. 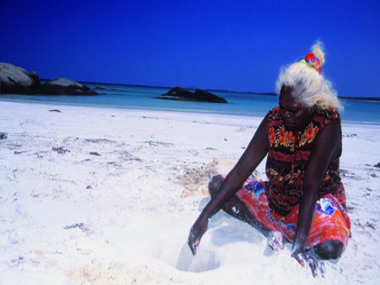 The Matriarchy was in full force, and is both remembered and recorded amongst the Yolngu – especially by the Marika family of the Rirratjingu clan – the first clan to emerge from the Djang'kawu womb after an amazing amount of ceremony had been completed on the beach at Yalangabara – now marked on our maps by the more prosaic name of Port Bradshaw. When the exhibition to hail the Djang'kawu, now showing in Darwin after 15 years of collaboration between the Marikas and curator Margie West of the the Museum & Art Gallery of the NT, was first reported to me, it was presented in terms of it being the greatest exhibition ever to apotheosize a single beach! But what a beach!...facing the rising sun and the mythical Burralku from which the Sisters came, and backed by high sand-dunes that turn a blinding white in that sun. Rays like the lorikeet-feathered string of our rangga! And the songs and the creative activities of the Djang'kawu continued around the coast of NE Arnhemland to Elcho Island and Milingimbi. But Yalangbara is the foundation site of creation for all Dhuwa moiety clans, and it was here that the Djang’kawu Sisters (and their Brother) began their miraculous journey shaping the land with their magical objects and giving birth to the clans of the Dhuwa moiety. The first of these clans was the Rirratjingu, born in the sand dunes at Yalangbara. The Marikas, who claim direct descent from these ancestors, have generated a substantial body of artwork about the Djang’kawu activities at Yalangbara and over sixty rare and significant works have been drawn together for the show. 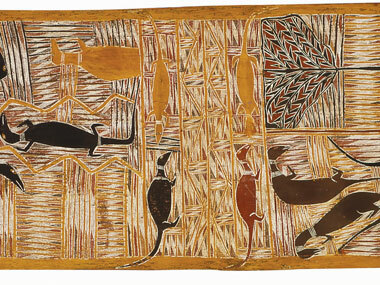 These include the first barks produced at Yirrkala in the 1930s, unique crayon drawings from the 1940s, and monumental narrative bark paintings along with contemporary sculptures, fibre items and prints. The feathered digging stick normally displayed in Parliament House alongside the famous Bark Petition asserting land rights by the Yolngu in 1963, is on show along with one of the carpets featured in the famous carpet copyright case. Importantly Yalangbara: art of the Djang’kawu is also the first survey for the exceptionally talented Marika family. It brings together three generations of artists highlighting the continuities as well as changes that have occurred in their painting over time. Thirteen artists are represented – headed by the paterfamilias, Mawalan 1 Marika, with work dating from 1939. He died in 1967 after early engagements with the missionary Wilbur Chaseling, the anthropologists Donald Thomson and Charles Mountford, and later the Berndts (who recorded all the Djang'kawu songs) and AP Elkin. “He held every law and miny'tji (clan design) for all the Dhuwa people”, explained his daughter, the artist Banduk Marika. “He actually controlled those designs, and designated them to each one of us when the time suited at Ngarra ceremonies”. Others involved are Wandjuk Marika – eldest son of Mawalan 1 – who took a lead in presenting the Bark Petition which eventually lead to the NT Land Rights Act in 1976; Banduk Marika – who came down to Sydney to study art at the National Art School; Yalmay Yunupingu, a dedicated teacher and wife to Mandawuy, the man behind Yothu Yindi; and Wanyubi Marika, who is taking the artform forward at Yirrkala with his barks playing on the relationship between deep and surface form. To celebrate its Darwin opening in November, more than 30 Yolngu travelled in from Yirrkala and Elcho Island to perform part of the sacred Ngarra ceremony devoted to the ancestral travels of the Djang’kawu across Yalangbara. It was an extraordinary and powerful performance - the audience had goose bumps as the dancers took command of the exhibition space dancing and singing of the Djang’kawu journey to the artworks that capture the same religious narrative. The exhibition will be displayed at MAGNT until 15 July, and open in the WA Museum in November 2012.